Sidewalk on Roosevelt Road in Chicago. I saw this inscription on my way to take the Red Line back to my apartment after visiting Shedd Aquarium in the South Loop with my roommate Remy. I originally took this picture just because it matched my blog title. What I didn’t realize is how much this word is shaping not only my ministry but my personality. 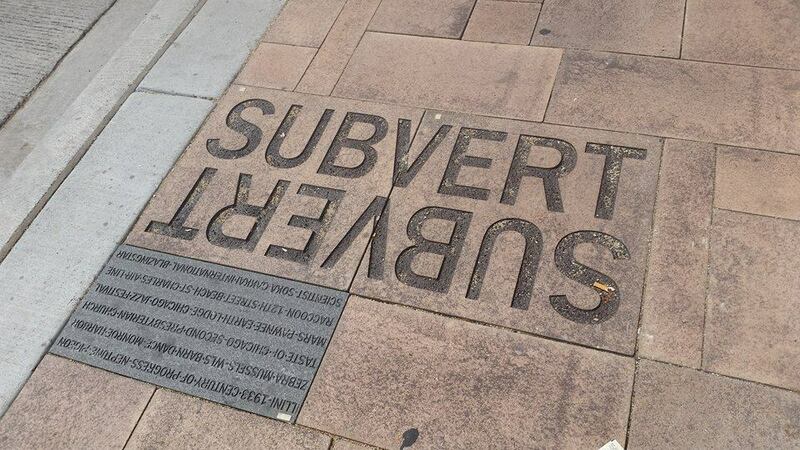 Merriam-Webster defines “subvert” as 1) to secretly try to ruin or destroy a government, political system, etc. 2) to make (something) weaker or less effective. Personally, I prefer James Marsters’ interpretation in which he defines a subversive artist as someone who divests society of lies it has been told. “Subversion” he explains, “is not necessarily about making the audience angry or uncomfortable. It’s a side effect of divesting the audience of the lies that they are being taught before they know that they’re being taught lies.”* As an artist with a background in both Theatre and Dance I resonate with Marsters’ definition much more strongly. One of the biggest lies that affects me is the idea that “women can’t be religious leaders” or that “women can’t be preachers.” Only fairly recently are we finally seeing more and more women in leadership positions. I’m tired of being told what I can or cannot do with my life so by my very existence as a Seminarian, and my work in Ministry through what ever form it may take I hope to take those lies and destroy them. I can’t help but laugh at how starkly different this worldview is from when I was in High School. Going on 10 years ago I wouldn’t tow the line. I followed the rules set out for me and I was good at it. Isn’t it interesting what the better part of a decade of life experience can do to change you? As I moved to Chicago, away from Wake Divinity, the place I know and love deeply for the person and the minister it has made me, I struggled to figure out where I belonged here. After all, I already had my M.Div. and though I’m pursuing my MAM this year, and will be the first woman to do so through the Lutheran Year partnership (woo hoo!) My program track is different from the rest of the people in my program. I’m not straight out of undergrad, nor am I pursuing a second career. Everywhere I turn I find myself in these liminal spaces, and it was uncomfortable not having a defined identity. My emotions came to a head in a Multicultural Center Luncheon when I was asked how I was doing. After venting for a couple minutes Cheryl Pero, director of the Pero Multicultural Center here at LSTC, said maybe your identity is to break down the barriers that categorize students. Subverting established identity markers, I thought. That’s something I’d been doing for 3 years now. I can handle that. Lately, I’ve learned to appreciate the beauty of undefined identity and I’m thankful for the courage to subvert the restrictions and classifications that society tries to place on me. In two weeks I meet with my Candidacy Committee for my Endorsement interview, phase 2 of my Ordination process in the ELCA. Much has changed of the scared girl they met in my Entrance interview 4 years ago. Let’s see what they think now. I hope they view the change for the better. * Quote taken from James Marsters’ Panel at Wizard World Comic Con in Sacrament (2014). Click Here for a video of the full Panel. This quote is at approximately 37:27. Thanks to Sean Long for posting this video.